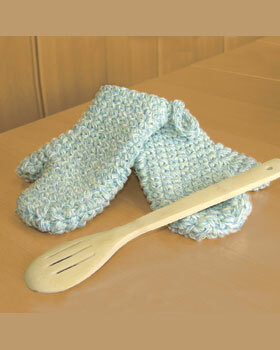 Crochet your own oven mitts to match the rest of your kitchen with this free pattern from Bernat Yarns. These beautiful oven mitts are quick and easy to make and are also useful. To fit average adult’s hand. Bernat Handicrafter Cotton Twists (340 g/12 oz) or yarn of your choice. 1 ball of #42116 (Country Twists). Size 9 mm (U.S. M or 13) crochet hook or size needed to obtain gauge. 7 sc and 8 1/2 rows = 4" [10 cm] with 4 strands of yarn. With 4 strands tog, ch 18. Join with sl st to form a ring. 1st rnd: Ch 1. 1 sc in each ch around. Join with sl st to first sc. 18 sc. 2nd rnd: Ch 1. 1 sc in each sc around. Join with sl st to first sc. Rep last rnd 6 times more. 1st rnd: Ch 1. 1 sc in each of next 8 sc. (2 sc in next sc) twice. 1 sc in each of next 8 sc. Join with sl st to first sc. 2nd rnd: Ch 1. 1 sc in each of next 8 sc. 2 sc in next sc. 1 sc in each of next 2 sc. 2 sc in next sc. 1 sc in each of next 8 sc. Join with sl st to first sc. 3rd rnd: Ch 1. 1 sc in each of next 8 sc. 2 sc in next sc. 1 sc in each of next 4 sc. 2 sc in next sc. 1 sc in each of next 8 sc. Join with sl st to first sc. 4th rnd: Ch 1. 1 sc in each of next 8 sc. 2 sc in next sc. 1 sc in each of next 6 sc. 2 sc in next sc. 1 sc in each of next 8 sc. Join with sl st to first sc. 5th rnd: Ch 1. 1 sc in each of next 9 sc. (Place marker for thumb). Miss next 8 sc. 1 sc in each of next 9 sc. Join with sl st to first sc. 18 sc. 6th rnd: Ch 1. 1 sc in each sc around. Join with sl st to first sc. Cont even until Mitt from beg measures 9" [23 cm]. 1st rnd: Ch 1. Draw up a loop in each of first 2 sts. Yoh and draw through all 3 loops on hook – sc2tog made. 1 sc in each of next 5 sc. (Sc2tog over next 2 sc) twice. 1 sc in each of next 5 sc. Sc2tog over next 2 sc. Join with sl st to first sc. 14 sts. 2nd row: Ch 1. Sc2tog over first 2 sts. 1 sc in each of next 3 sc. (Sc2tog over next 2 sts) twice. 1 sc in each of next 3 sc. Sc2tog over next 2 sc. Join with sl st to first sc. 10 sts. Fasten off. Sew top seam. With 4 strands tog, join yarn with sl st at marked sc for Thumb. 1st rnd: Ch 1. 1 sc in same sp as last sl st. 1 sc in each of next 7 sc. Join with sl st to first sc. 8 sc. Rep last rnd 4 times more. Next rnd: Ch 1. (Sc2tog) 4 times. 4 sts. Fasten off, leaving a long end. Thread end through darning needle and draw through rem sts. Fasten tightly. With 4 strands tog, ch 12. Fasten off leaving a long end. Sew loop to foundation ch as shown in picture.